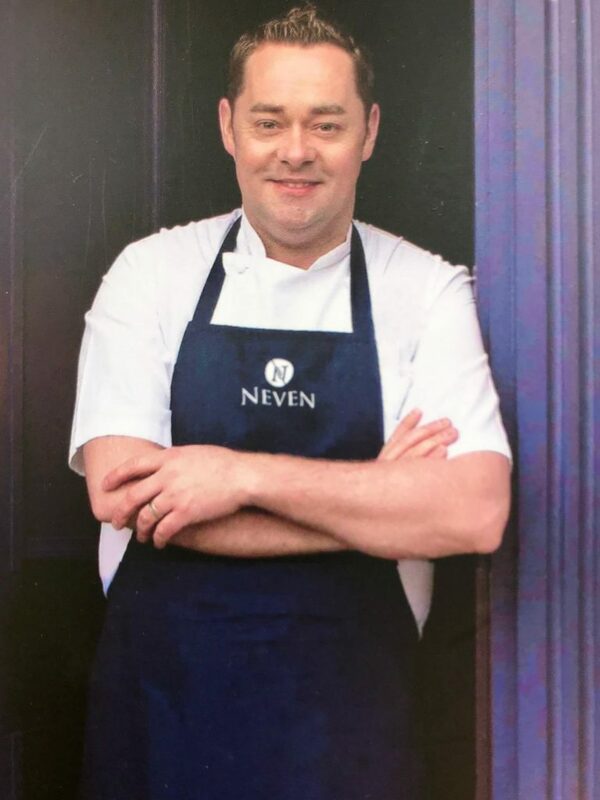 For three years, Neven Maguire has been one of the most cited names in the Irish Independent Reader Travel Awards. His MacNean House and Restaurant in Blacklion, Co. Cavan, is a previous winner of “Ireland’s Favorite Foodie Experience,” and this year he tops the list for “Favorite Breakfast.” One reader claimed, “I’ve never had a better breakfast in Ireland;” another said, “It’s beyond great;” and another gushed, “This was the best breakfast ever. Firstly, there are real freshly squeezed juices. Then, fruit salad with yoghurt, shots of exotic fruit smoothies, homemade breads and scones. 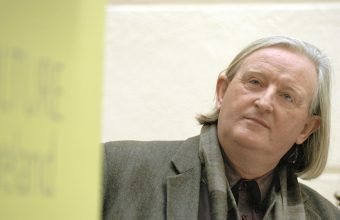 But the main event was the kippers with tomatoes and baby mushrooms washed down with lashings of properly brewed tea.” Many voters praised not only the selection and range, but also the quality of Irish ingredients: “Even better than the dinner!” The most cited dish on the breakfast menu was Neven’s legendary porridge with Irish Mist and Honey, or as many suggested, “quite simply ‘porridge to die for.’” Neven has agreed to share some breakfast recipes from “The MacNean Restaurant Cookbook” with our readers. In a medium saucepan, bring porridge oats, milk and water to boil; reduce heat and simmer, stirring constantly, for 8 to 10 minutes, or until slightly thickened. (It’s important the porridge has a nice, soft dropping consistency, so add a little more milk if you think it needs it). 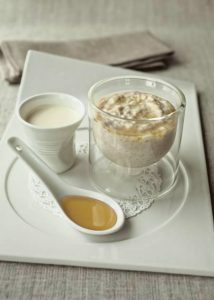 To serve, spoon porridge into warmed bowls; drizzle with some honey and Irish Mist and top with cream. “I just love the combination of prunes and tea,” Neven says, “and we always have it on the menu as one of our lighter breakfast options. 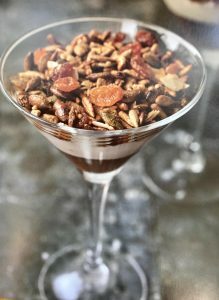 Feel free to experiment with a more perfumed tea, such as Earl Grey or Darjeeling, but my personal preference is definitely Barry’s Gold Blend.” Neven offers his recipe for granola here, but you can substitute your favorite recipe or use prepared granola to top the prunes. 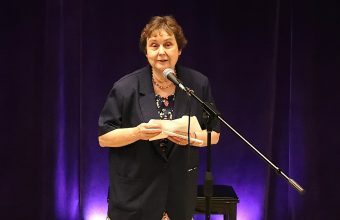 To prepare ahead, he offers this tip: the prune purée will keep for 2 weeks in the fridge and the granola keeps for 2 weeks in an airtight container. The layered glasses, without the granola, can be stored overnight in fridge covered with plastic. Make granola. Line a baking sheet with parchment paper; preheat broiler. Make prunes. In a medium saucepan, combine prunes, tea bag, water, sugar and vanilla. Bring to simmer and cook for 8 to 10 minutes, or until prunes are plumped. Remove from heat and let cool completely; remove and discard tea bag and pod. Put prune mixture into blender and process until smooth; transfer to small bowl, cover with plastic wrap, and refrigerate until ready to serve. In a separate bowl, combine yogurt and vanilla seeds; cover with plastic wrap and refrigerate until ready to serve. To serve, divide prune purée among 6 martini glasses and spoon yogurt over to cover completely; top with a layer of granola. To prepare ahead, he offers this tip: the butter sauce will keep for 4 days in the fridge in an airtight container. If using spinach, it can be cooked the day before and kept wrapped in a paper towel in fridge. Make eggs. Heat a large pan with 4 pints water. Add vinegar and bring to boil. Break each egg into water, then reduce heat and simmer gently for 3 minutes, or until eggs are just cooked through but yolks are still soft. With a slotted spoon, remove eggs and plunge into a bowl of iced water. Cook bacon until crisp and golden brown; set aside. In a large skillet over medium heat, heat 1 tablespoon of the butter. When it starts to foam, add spinach; sauté for 2 to 3 minutes, or until just wilted. Season to taste with salt and pepper; drain off excess liquid and then return to pan to keep warm. With a 3-inch biscuit cutter, cut out eight rounds of brioche. Arrange on a grill pan and cook, turning once, for 2 to 3 minutes, or until lightly toasted. Spread with remaining tablespoon butter. Make butter sauce. In a small pan over medium heat, whisk together cream and mustard. Whisk in butter, cornstarch and lemon juice and continue to whisk for 2 to 3 minutes, or until thickened. Stir in chives and season to taste with salt and pepper; keep warm. Bring a large pan of salted water to boil. Add poached eggs and cook for 1 minute to warm through. To serve, place two brioche on warmed plates and spoon on a small mound of spinach. 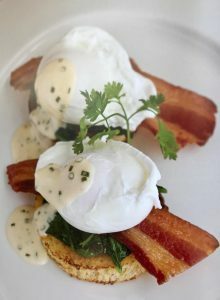 Place bacon on top of spinach and then place a poached egg on top. Spoon butter sauce over and garnish with chervil. Keeping company with MacNean House in the top five favorites are Castlewood House, Dingle, Co Kerry (more on this after my stay in May); Brother Hubbard, Dublin; Liberty Grill, Cork; and Dela, Galway.